A strange title for a blog I’ll grant you, but then you don’t like badgers like I know badgers. 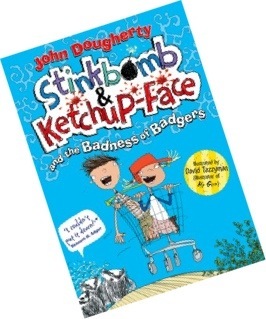 And I didn’t know badgers well until Monday, when John Dougherty came for a visit. 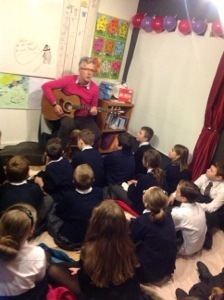 John’s song about underpants proved very popular…I can’t imagine why! 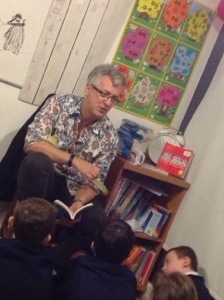 After a spot of lunch, John did it all again with another class of children, before collapsing on the sofa for a while to meet passing book lovers. By the end of the day we had run out of John’s books, but never fear, we have now re-stocked. 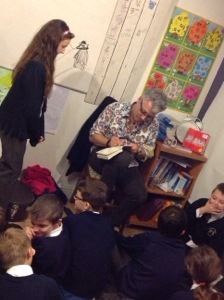 If you can get to an event with John (or want him to visit your school), I can’t recommend him highly enough. We had a fab day and can’t wait to read the next instalment of Stinkbomb and Ketchup-Face. p.s. We are happy to provide discounted books for author visits either at the shop (for booked in groups) or in schools.